As renewable technologies grow, the energy retailers must grow with it – and that’s just what Diamond Energy has done with its GridCredits100 deal which sees solar customers credited with up to 100 cents per kWh in certain periods. 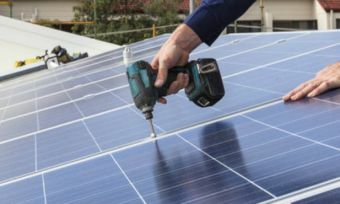 A growing number of Aussie households and businesses are installing solar storage systems to reduce costs and their dependency on energy retailers. These are essentially batteries that store the electricity your solar system produces through the day for later use. In addition, customers can export their excess power back into the grid, from which they receive a feed-in tariff. While most feed-in tariffs have fairly modest fixed pricing, Diamond Energy customers signed up to the GridCredits100 plan will occasionally be given the opportunity to sell their electricity to the retailer for a whopping 100c/kWh. To understand the GridCredits100 scheme, you first need to understand how the Australian energy market works. Essentially, your electricity retailer purchases electricity from an energy network at a wholesale price before reselling this electricity to its customers. The price a retailer pays for electricity will change every five minutes – this is referred to as a spot price. The spot market can be incredibly volatile – it may sometimes cost retailers less than 1c/kWh to purchase electricity, and sometimes it can cost them as much as $14/kWh. Electricity retailers set the electricity rates for households and businesses by predicting the average spot price over the next 12 months. When the spot price is lower than what retailers charge their customers, retailers are turning a profit. Likewise, when the spot price is higher than average, the retailer is running at a loss. It would stand to reason that energy retailers are more likely to overestimate the cost of wholesale electricity in order to avoid losing out. Diamond Energy’s GridCredits100 scheme essentially means that when wholesale grid electricity is too expensive, the retailer will instead draw electricity from the solar storage systems of customers who signed up. In exchange, customers will be credited 100c for each kWh of electricity Diamond Energy draws from their storage system. This is really a mutually beneficial arrangement. Diamond Energy will presumably only buy electricity from customer’s storage systems when it is cheaper than purchasing from the grid. Meanwhile, the 100c/kWh credit customers receive is approximately three to four times that which customers would have saved had they used the electricity themselves. Most solar storage system owners likely don’t have a Reposit box yet, however customers can organise its installation through Reposit. There is nothing in the GridCredits100 terms that suggests it will affect the rates customers are charged. Unless Diamond Energy initiates the purchase of solar from your battery, solar customers will continue to receive its standard retailer tariff of 8c/kWh for exported electricity. In short, if you’re a Diamond Energy customer and you have a solar battery, then there’s little reason not to be signed onto this deal. Is GridCredits100 worth switching retailers for? Well that’s a lot less clear. GridCredits100 undoubtedly has potential to deliver great savings, but they’re unreliable savings. While supply and demand of grid electricity has a large influence on spot prices, they’re virtually impossible to predict. How much GridCredits100 can save you will also depend on your distribution network as well as your storage system size (i.e. how much you can export). It would appear that customers with a large storage capacity could stand to save the most. This volatility means it’s quite difficult to assess how much a GridCredits100 customer could save. For that reason, while the GridCredits100 scheme is something to keep in mind, when comparing solar retailers, it’s probably better to focus on normal rates, feed-in tariffs and any possible discounts.